A University of Toledo faculty member has been selected as a 2012 Cottrell Scholar in recognition of his passion for both research and education. Dr. J.D. Smith, UT associate professor of astronomy, was named a 2012 Cottrell Scholar by the Research Corporation for Science Advancement for his investigative work and teaching. The prestigious award, which includes a $75,000 grant, was given by the Research Corporation for Science Advancement to Dr. J.D. Smith, UT associate professor in the Department of Physics and Astronomy. The Research Corporation for Science Advancement, which is celebrating its 100th anniversary this year, awards only professors in their third year of a tenure-track appointment. It recognizes outstanding young faculty in the fields of astronomy, biochemistry, biophysics, chemistry or physics who excel in both research and teaching, and who show exceptional potential in both areas. Smith was the only recipient in astronomy this year, and one of only 11 awardees, who hailed from institutions that included Cornell, Yale, CalTech and UCLA. He will use the award to support two projects, one research-based and one educational, that he proposed to the Research Corporation for Science Advancement last summer. 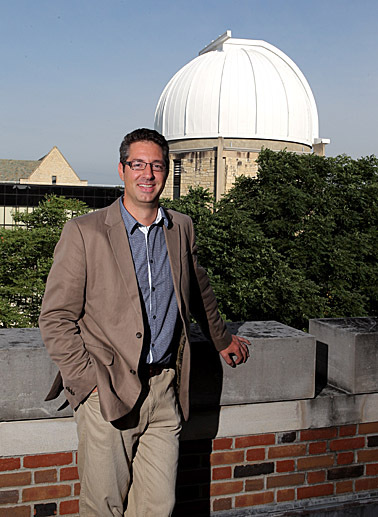 For his research project, Smith plans to study “How Galaxies Die and Why,” investigating when and how galaxies stop producing stars or “die.” Smith explained that galaxies normally are forming new stars from reservoirs of gas and dust, but can stop quite abruptly and for very poorly understood reasons. In order to conduct his research, Smith plans to utilize the Herschel and Spitzer space observatories, along with ground-based telescopes, to follow the gas and dust in galaxies transitioning from a star-forming state to “red and dead,” a term used by astronomers because of the red appearance of old stars. With an international group of collaborators, Smith has helped discover a new population of such rare but important galaxies. “We’ve found a new way to identify galaxies undergoing this transition, and now we’re trying to study in particular not what’s happening to the aging stars within them, but what becomes of all this raw material, the stellar fuel itself,” Smith said. By following the fuel for the first time, Smith hopes to gain insight into the processes that control the life and death of all galaxies in the universe, including our own. For his educational project, Smith wants to improve the impact of elementary astronomy labs, both at UT and beyond. Smith said he hopes to move a number of the labs into UT’s Ritter Planetarium to utilize the unique capabilities of the new SciDome XD full-dome digital projector, a major renovation completed last year. He plans to share these lab modules with other institutions equipped with similar full-dome projectors. With his astronomy colleagues, Smith also plans to continue hosting international astrophysics conferences at UT, following up the very successful “WittFest” meeting held on campus in 2010 in honor of Dr. Adolf Witt, Distinguished University Professor Emeritus of Astronomy. Smith is one of three Cottrell Scholars from UT since the program’s inception in 1994. Dr. Karen Bjorkman, dean of the College of Natural Sciences and Mathematics, won the award in 1999 in the field of astronomy, and Dr. Ale Lukaszew, UT assistant professor in the Department of Physics and Astronomy, won in 2004 in the field of physics. This month, Smith will join other Cottrell Scholars in Tucson, Ariz., to discuss their research and collaborate on bringing that research into the classroom. “In the end, research is about people — people curious about or even driven by a fundamental desire to understand the universe around them,” Smith said. This entry was posted on Thursday, July 19th, 2012 at 4:23 am and is filed under Research, UToday .